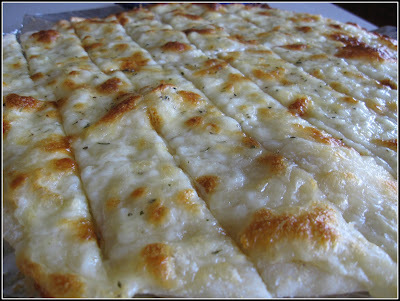 Yummmmm... One of my favorite local pizza places is in Staunton, called Shenandoah Pizza. 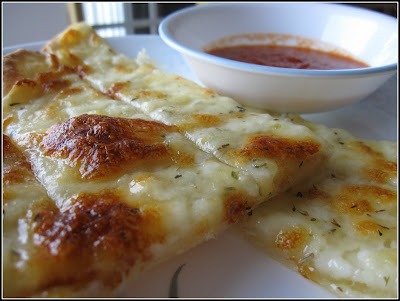 Their cheesy garlic bread is to KILL for. It's so good, and this is a perfect homemade version! I use my mom's pizza dough, but I've heard you can go to your local pizza places and buy dough. That's so easy! I may look into that for easy freezer-dinners. 1.) Mince garlic cloves into some olive oil to marinate. Preheat oven to 425. 2.) Prepare dough, roll out to about 1/2" to 3/4" thick. 3.) Brush olive oil (infused with garlic) over the dough, Sprinkle on cheese. 4.) Drizzle remaining garlic and oil over top. Sprinkle with Italian Seasoning. 5.) Bake at 425 for 15-18 minutes until golden and bubbly. 6.) Serve with a side of marinara. Try not to eat the whole thing in one sitting. YUM! I will need to try this out asap! !